CinemaNext provides clients with fully-integrated cinema solutions across the board for exhibition anywhere in Europe, from projection systems, audio systems and central systems to cinema outfitting. 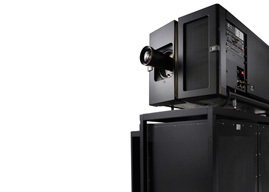 With our seasoned engineers and installation teams, we guide clients in selecting the right cinema equipment to suit their specific needs for a retrofit or new cinema build. As of today, over 7,000 screens have been installed in single-screen sites and large multiplexes & cinema chains, making us the largest integrator in Europe with leading manufacturers. We guarantee attractive pricing for cinema projectors and best-in-class support. Browse our online catalog of products or enter any keyword in our search engine to find related products.